Precious metals futures advanced together for the first time in three days on Friday, with gold and silver snapping a longer string of four daily declines. Still, most metals stumbled sharply for the week, in June, for the second quarter, and in the first half of 2018. Gold for August delivery on Friday rose $3.50, or 0.3%, to settle at $1,254.50 an ounce on the Comex division of the New York Mercantile Exchange. "The U.S. dollar has been the biggest beneficiary as investors’ first choice safe haven," Bloomberg News quoted Gavin Wendt, senior analyst at MineLife Pty. "This has indirectly led to gold-price weakness, as the dollar and gold typically move inversely to each other. 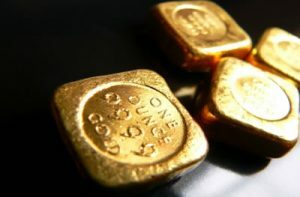 With the emergence of inflation, gold is likely to find a bottom, as the dollar’s gains weaken." Gold futures logged weekly, June and quarterly losses of 1.3%; 3.8%; and 5.5%. The yellow metal declined 4.2% through the first half of 2018. On Thursday, gold prices ended at their lowest level since Dec. 13. "Fifteen market professionals took part in the survey. There were eight votes, or 53%, calling for gold prices to decline. There were three votes, or 20%, calling for gold to rise, while four voters, or 27%, look for a sideways market. Meanwhile, 878 voters responded in an online Main Street survey. A total of 406 respondents, or 46%, predicted that gold prices would be lower in a week. Another 325 voters, or 37%, said gold will rise, while 147, or 17%, see a sideways market." Elsewhere, silver for September delivery advanced 15.7 cents, or 1%, to settle at $16.198 an ounce. Silver futures registered losses of 1.6% for the week and month, 0.5% for the second quarter, and 5.5% for the year to date. October platinum added $2.50, or 0.3%, to $857.70 an ounce, but dropped 1.8% for the week and sank 5.8% in June. Palladium for September delivery jumped $20, or 2.2%, to $950.90 an ounce, for a 0.5% weekly increase, but logged a monthly decline of 3.1%. As for the second quarter, the pair divided with platinum down 8% and palladium up 0.8%. Both are sharply lower through the first half of 2018 with losses of 8.6% for platinum and 10.4% for palladium. Gold declined $1.10, or 0.09%, to $1,250.45 an ounce. Silver slipped 8 cents, or 0.5%, to $16.03 an ounce. Platinum lost $1, or 0.1%, to $851 an ounce. Palladium rose $8, or 0.8%, to $953 an ounce. In LBMA results for week, the losses reached 1.5% for gold, 2.4% for silver, 1.8% for platinum, and 0.3% for palladium. In June, LBMA prices registered declines of 4.2% for gold, 3.1% for silver, 6.2% for platinum, and 3.3% for palladium. As for the second quarter, losses reached 5.5% for gold, 1.5% for silver, 9.1% for platinum, and 1.8% for palladium. Finally, they marked year-to-date declines of 3.6% for gold, 5% for silver, 8.2% for platinum and 9.8% for palladium. American Eagle gold coins tallied to 19,500 ounces in June, registering a decline of 18.8% from 24,000 ounces in May but jumping 225% from 6,000 ounces in June 2017. Year to date sales at 115,500 ounces are 40.3% lower than the 193,500 ounces delivered during the first half of 2017. American Eagle silver coins reached 435,000 ounces for the month, rising 14.5% from 380,000 ounces in May but falling 55.9% from 986,000 ounces in June of last year. 2018 Silver Eagle sales at 6,822,500 are down 44.2% from the 12,233,500 sold through the first six months of last year. American Buffalo gold coins climbed 6,000 ounces in June, logging declines of 63.6% from 16,500 ounces in May but advancing 3x the amount from the 2,000 ounces in June 2017. Year to date sales at 53,000 ounces are 19.7% lower than the 66,000 ounces moved during the first half of 2017. America the Beautiful Five Ounce Silver Bullion Coin sales were muted in May. They advanced by 150,000 ounces in June, up 4.2% from the June 2017 total of 144,000 ounces. Sales for the year so far at 450,000 ounces are 20% higher than the 375,000 ounces sold through the same six months in 2017. American Eagle platinum coins reached 20,000 ounces in their February release month, matching annual sales in years 2016 and 2017. The U.S. Mint sold another 10,000 ounces in May for a total of 30,000 ounces. No platinum coins sold in June.